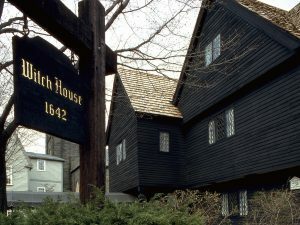 Get Wicked in Salem this Halloween Season! 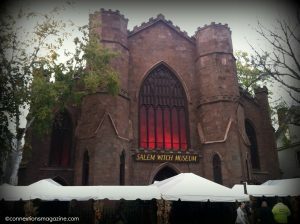 As a New Englander, you probably already know that Salem, Massachusetts is the place to be during Halloween. With countless attractions including haunted houses, plays and museums, you will surely experience the diverting spookiness of this magically famous town. Go back in time to the year 1692 as a puritan juror for the Cry Innocent: The People Vs. Bridget Bishop trial. Help the judge determine if Bridget is guilty of practicing witchcraft, or if she’s just an innocent victim of false assumptions. Listen to the witnesses’ testimonies and decide her fate. Not many people are able to say they were apart of a witch trial but you can be one of the few! For those seeking a little more thrill, Salem’s Best Haunted House will bring you through scenes of Olde Salem with 3-D glasses on. Decorated with dozens of creepy props, it will be difficult to determine what is real and what is fake. So don’t let your guard down; live actors will be waiting to pop out when you least expect it! See if you’re brave enough to make it out! Watch a 75 minute long magic show at Danvers State Mental Hospital. Salem Screams & The Salem Haunted Magic Show presents its’ 2016 Hysteria: Asylum. As if magic tricks aren’t enough, there will be comedy, hypnotic mind reading, scary illusions, surprising stunts, and more. You will also get the chance to be picked to participate in the show. This magic show with a creepy Halloween twist is something the whole family can enjoy and is still appropriate for kids. Party with warlocks and witches at the 2016 Salem Halloween Ball on Friday, October 28th at Hawthorne Hotel. Aside from eating and dancing, enjoy a performance by Hadiya, listen to musical guest Dragon Ritual Drummers, and get a free psychic reading. You can also join in on rituals with hosts Christian Day and Brian Cain, and get a professional picture taken for free in the photo room. The costume theme for 2016 will be Over the Rainbow: The Magical World of Oz. 1st place winners get $1,000 dollars cash prize, 2nd place gets $200 gift certificate at HEX, and 3rd place will win 2 free 15 minute readings at Omen. Every Saturday evening during the month of October, Pickering Wharf offers a costume cruise party. 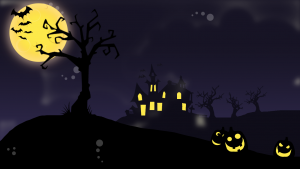 This Halloween BOO’s Cruise takes you around the Mahi Mahi Harbor. Dance with your friends for 2 whole hours of music by DJ Snow. Meet new people and have some drinks at the bar or food off the grill. Come in your best costume to get a chance to win prizes. This 21+ event is a fun mixture of Halloween and nightlife. If you’re a horror film fanatic, Count Orlok’s Nightmare Gallery is one attraction you must visit. Go see more than 60 life-size wax figures of your favorite classic characters! Freddy Crugar, Michael Myers, Jason, Pennywise, and yes- even Winnie Sanderson from Hocus Pocus will be there! Walk around and pose for pictures with all of the monsters that haunted you as a child. October 28th-31st you’ll get the opportunity to meet the real actor behind the Michael Myers mask, Tony Moran. For a great place to eat and drink during your trip to Salem, Brother’s Taverna is right next-door to Count Orlok’s Nightmare Gallery, on 283 Derby Street. Any time from 6am – 11pm you can have breakfast, lunch, or dinner. Enjoy a plate of Fettuccine Alfredo with a bottle of our Wicked Soft Chardonnay or a slice of pizza with a glass of our Wicked Smooth Merlot. 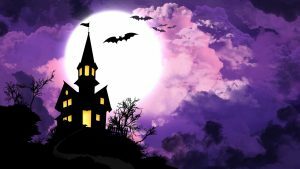 More places you can find Wicked Wines to top off a frightfully fun-filled time in Salem are: Nicole Food store, Cosgrove Liquors, Los Amigos Market, New Salem General Store, Salem Liquors (Canal St.), Salem Liquors (North St.), and Your Neighborhood Market. This entry was posted in Events and tagged halloween, haunted, hauntedattractions, newengland, salem, salemma, scary, spooky, witch. Bookmark the permalink.